Last Autumn I painted a few similar paintings to this. The difficulty was placing the leaves onto the wet paint of the sky. Wet on wet has a particular look, created simply by the process. Its very difficult to get sharp details, either fine lines of branches or the sharp points of paint to represent foliage when the canvas has a layer of wet paint. My workaround was to use a very thin wash of sky colour in White Spirits. This I then evaporated with a hair dryer. The resultant background sky was OK to paint on but looked like what it was – a thin anaemic layer. The paintings worked because I covered most of the sky colour with foliage (an example here). The medium of the above painting is Alkyd fast drying oil paint. A rich layer of sky was painted and within a half hour the foliage and leaves were painted in sharp details onto this wet paint. The sky colour was not completely dry but dry enough. A definite plus for my alla prima method. As I was progressing through the painting, from time to time I’d add a layer of shadow colour, these getting richer with every layer. All will be seen in the video which I will post in a day or two. See you then. 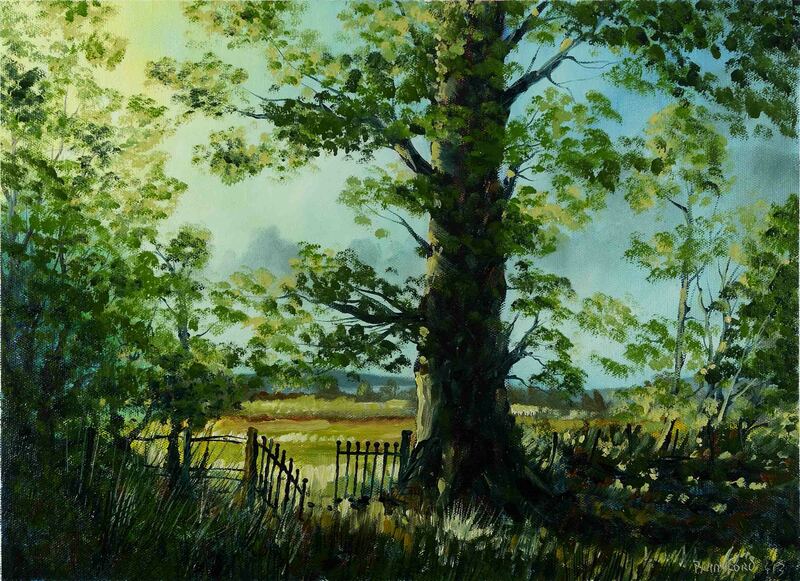 This entry was posted in Oil Painting and tagged Alkyd, Art, Culture, Education, Inspiration, Irish landscape, Medium, Oil Painting, Oil Painting Instruction, Oil Painting Landscape, painting, Pictures, Spring, Trees, Woodland. Bookmark the permalink. Very rich sky. The color, too, nice and warm…can almost smell the spring foliage.